Lust is an enemy and is on the other team. 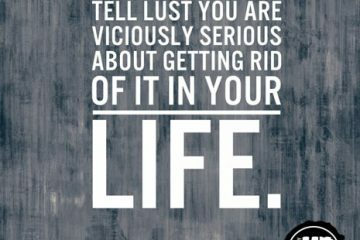 Lust is 100 percent willing to destroy you, get you to waste your life, cause you to not reach your destiny, or create the consequences of sin in your life. In other words, lust is committed to your complete destruction, and the potential to lust lives within every man. Lust is like the linebacker. Once the ball is snapped, he is committed to move you. The snap has already been released, and all of hell is committed to get you to lust and stay lusting so you are destroyed. They can’t get you to lust. That’s your choice. Once you make that choice, if you continue, hell knows the outcome. In the last tip, I asked you to put down a percentage of your willingness to commit to a lust-free life. Willingness matters. If you are not fully committed, you will continue to struggle with little compromises and little secrets. Just look behind you. The lust you have agreed with, considered, and participated in is still there. Behind the choice to lust, you had two options: lust or not. Think like God or think like an earthly man. You have probably had moments of both, and you realize that willingness played an important role in the choice you made. 1. How will you know how willing you are to be lust-free? 2. Can your willingness to be lust-free be measured in your behaviors? 3. If yes, what behaviors can you begin to measure in your life that will indicate to you how willing you are to be lust-free? 4. What man can you share this with?